It has been a while since photos of the V8 twin-turbo BMW X5 have popped up on internet. 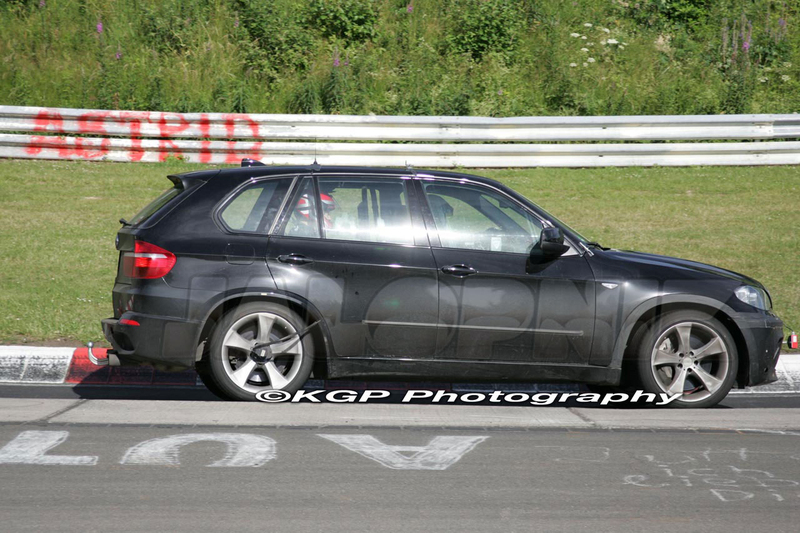 Back in October '07, the 2010 BMW X5 was spotted during testing at Nurburgring. In recent series of photos from the KGP folks, the V8 twin-turbo has been seen again at the 'Ring, but this time, showing a little more of its "body". We can clearly see a major improved front, due to an M3 look-alike bumper. The new X5's front fascia uses all of the cues consistent with BMW's M division, even though despite the rumors, the V8 twin-turbo X5 will not carry the //M badge. They are looking to differentiate from Mercedes-Benz who has placed their AMG stamp on most of the models. This same very model seems to be equipped with lower suspensions and larger wheels. Could this new X5 take on the competition when it comes to sport SAV/SUV's performance?